I’ve been to visit the frescoes in Morra by Cortonese (from Cortona) Renaissance artist Luca Signorelli a couple of times. Morra is tucked away in the remoter parts of the Tuscany Umbria border. its 15 minutes’ drive to the nearest small town (Trestina) and the first time I went there it was the custodian’s day off. Of course, the second time I went I had forgotten the opening times and tried to find out in advance, this proved impossible from Città di Castello’s tourist website and I resorted to the phone, no one knew the opening times. I was relieved to find that the church was open, but disappointed not to be allowed to take photos. Luckily for readers of this blog I returned to the church once more for a Christmas carol service when I took these shots (without flash photography, you will be pleased to know). 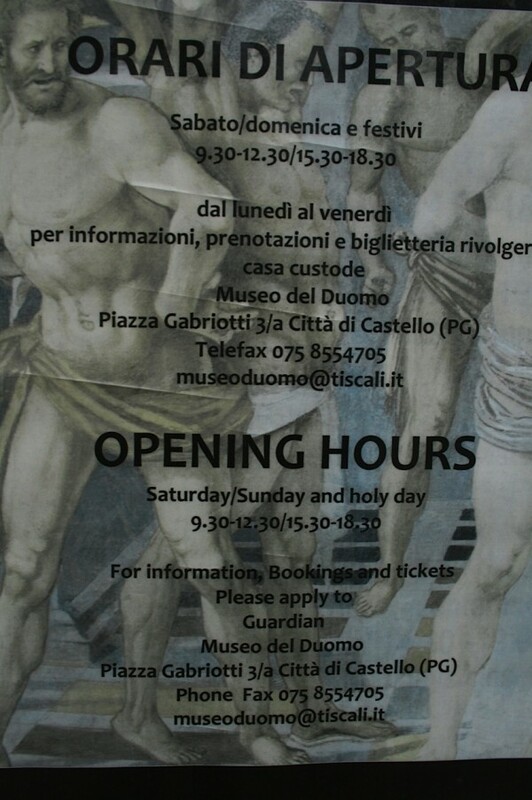 Opening Times For Luca Signorelli’s Morra Frescoes. Despite what is says on the poster about going to Città di Castello to get a ticket, you can go straight to the custodian’s house (down the track from the church) and she will sell you a ticket and open the church. It doesn’t say anything about closing days but maybe to avoid disappointment, it’s best to go on weekends between 9.30-12.30 and 15.30-18.30. 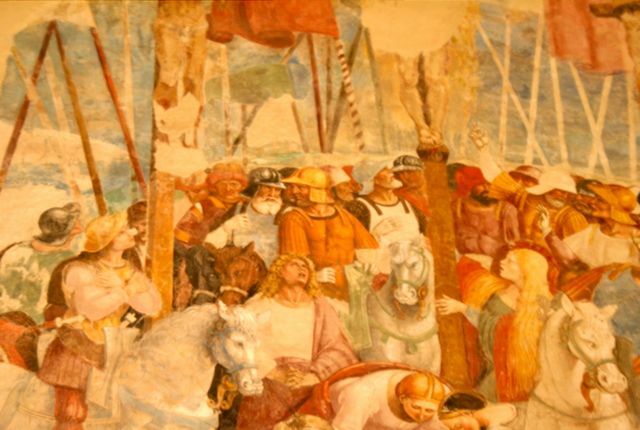 If you have been to see the frescoes in Arezzo by Luca Signorelli’s teacher, Piero della Francesca, you might be struck by the similarity between Piero’s battle scenes and Signorelli’s crucifixion. The strongly foreshortened horses and crowded soldiers are features of both paintings.